Part 4: Features, options, and technologies of communications systems -- The Internet is great for doing business, but it hasn't replaced the telephone. Telephone systems can be high productivity systems, but they do not have to create high overhead. The trick is to take advantage of available technology, to have great services, and to control costs. We will tell you how to do all of those things. Hear from technologists as well as from a small business manager who keeps focused on the job of sales while making sure his business has effective and efficient telephone services. How does he do that? Join us and find out! Part 5: Work Smarter and Control your Workflow -- The Internet is great for doing business, but it hasn't replaced the telephone. Telephone systems can be high productivity systems, but they do not have to create high overhead. The trick is to take advantage of available technology, to have great services, and to control costs. We will tell you how to do all of those things. 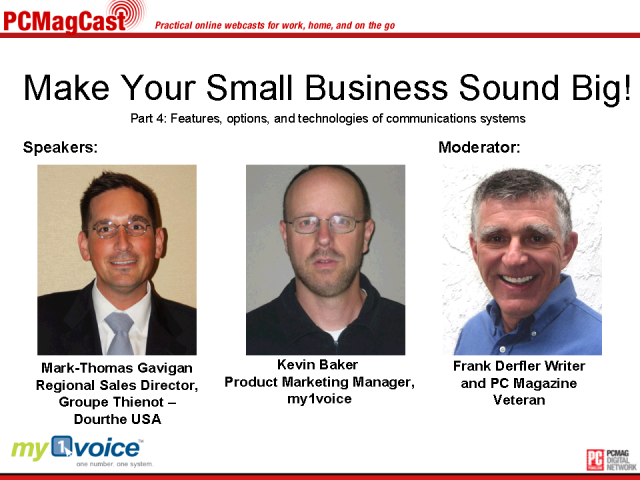 Hear from technologists as well as from a small business manager who keeps focused on the job of sales while making sure his business has effective and efficient telephone services. How does he do that? Join us and find out! Part 3: Mobile, work-at-home, & virtual employees -- The Internet is great for doing business, but it hasn't replaced the telephone. Telephone systems can be high productivity systems, but they do not have to create high overhead. The trick is to take advantage of available technology, to have great services, and to control costs. We will tell you how to do all of those things. Hear from technologists as well as from a small business manager who keeps focused on the job of sales while making sure his business has effective and efficient telephone services. How does he do that? Join us and find out! Part 2: Making a small business sound big -- The Internet is great for doing business, but it hasn't replaced the telephone. Telephone systems can be high productivity systems, but they do not have to create high overhead. The trick is to take advantage of available technology, to have great services, and to control costs. We will tell you how to do all of those things. Hear from technologists as well as from a small business manager who keeps focused on the job of sales while making sure his business has effective and efficient telephone services. How does he do that? Join us and find out! Part 1: Business Communications Systems and delivering them across the Internet -- The Internet is great for doing business, but it hasn't replaced the telephone. Telephone systems can be high productivity systems, but they do not have to create high overhead. The trick is to take advantage of available technology, to have great services, and to control costs. We will tell you how to do all of those things. Hear from technologists as well as from a small business manager who keeps focused on the job of sales while making sure his business has effective and efficient telephone services. How does he do that? Join us and find out!